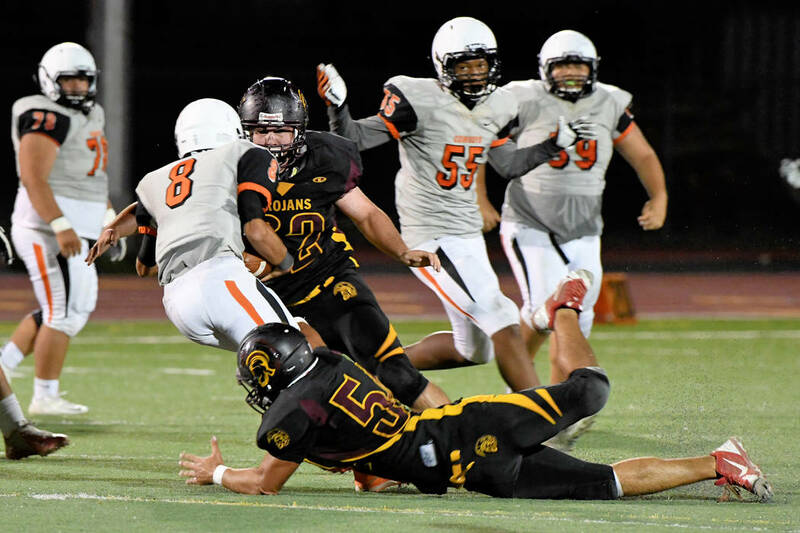 The Pahrump Valley High School football team renews its rivalry with the Chaparral Cowboys (1-0, Sunrise League) this week as they travel on the road to take on the Cowboys tonight, who won their opener last week, beating Bonanza High School 14-6. Peter Davis/Special to the Pahrump Valley Times Jeremy Albertson gets a sack against Chaparral last year. He had at least one against Durango last week. Expect Albertson to come alive this game. Pahrump Valley is looking to redeem itself after losing a close game against Durango, 26-19. The Trojans (0-1, Sunset League) will look to control the game with their running game, something that didn’t happen against Durango in the first half. “We will continue to do what we do, run the rock,” Trojans coach Joe Clayton said. Chaparral made it to state last year for the second year in a row, but then lost a lot of key personnel to graduation. The Trojans need to watch the quickness of the Cowboys, according to Clayton. Senior running back for the Cowboys, TyRay Collins had three interceptions on defense against Bonanza and also scored both touchdowns on offense. Their running game was led by Collins, who rushed for 128 yards against Bonanza. Sophomore Sheik Fofanah was the other threat for 95-yards rushing. The Cowboys against Bonanza kept the ball on the ground with only five-yards receiving. The game will be won by the team that establishes the run game. The Las Vegas Sun has Pahrump losing, 23-21 and 27-13. Pahrump Valley Times prediction: It will be a low-scoring game, look for the Trojans to edge out Chaparral, 21-20.